How much do you want to save? Now is the time to shop Engine Trim Collections. 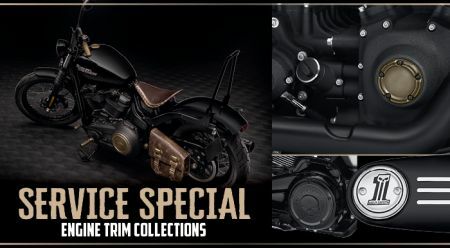 Choose from your choice of Derby Covers, Timer Covers, Air Cleaner Covers and Trim, and any other Harley-Davidson Genuine Motor Parts and Accessories Engine Trim Collections. Get $20.00 off Engine Trim Collections! The installation of any 2 Engine Trim Accessories. $30.00 off Engine Trim Accessory Installation! The installation of any 3 Engine Trim Accessories. $40.00 off Any 4 Engine Trim Accessories! The installation of any 4 Engine Trim Accessories.